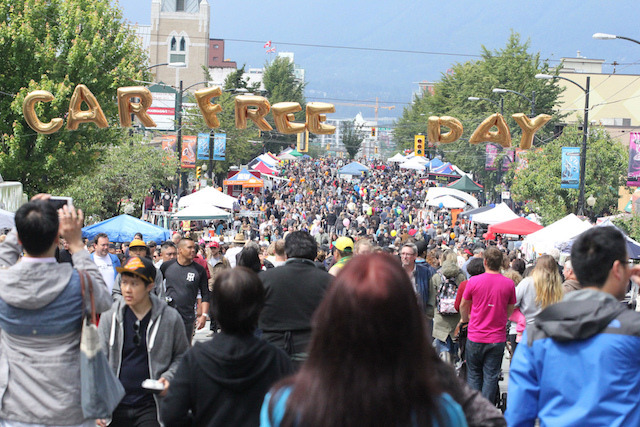 Car Free Day Vancouver is almost here and being that Vancouver is so enthusiastic about the event, it actually lasts for longer than a day in some neighbourhoods! This is your chance to hop off the sidewalk and stroll the streets of your community, or one you’d like to visit for the day, to experience live music, food, and the culture that makes each of these areas so charming. Follow the main Car Free Day Twitter and Facebook accounts for the latest news and links to each event. Use hashtags #CFDrive #CFKits #CFMain #CFWest when tweeting about your car free neighbourhood.